So, Number Tap has been out for 2 months now. I thought I would share some stats on how it is doing. Considering I had a no marketing budget, I am fairly happy with how it has performed. I have had 3,296 total downloads and has mostly 4-5 star ratings across the stores. It launched for the cheapest paid price point which is $0.99. 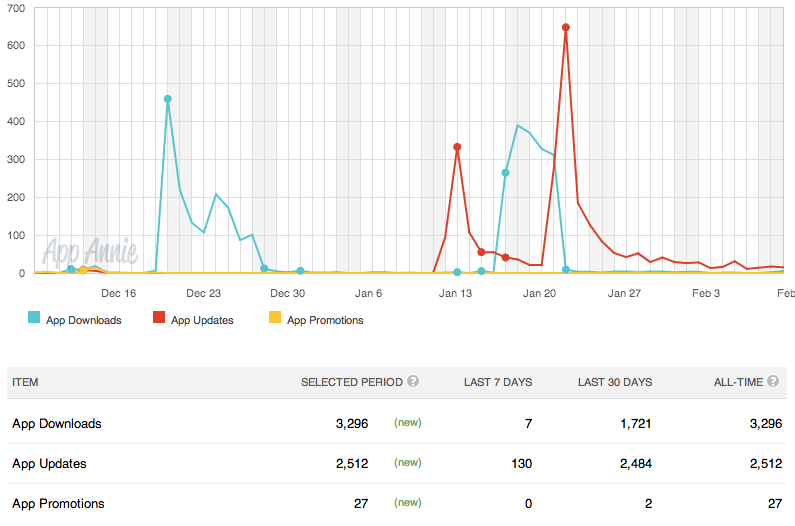 Sadly though, the majority of the downloads were done while it was a free app during promotional periods. You can see by the table below how Number tap performed on the daily charts by seeing the highest ranks it has achieved. I sent out review promo codes to around 30 websites which they could use to download the app early with intent of reviewing. I saw around 1/3 of these codes used and out of that I got very little response. The team at Corona Geek gave me the opportunity to do a guest blog post to help promote it, but most of the places emailed me back saying that they would review the game if I paid for a review. I declined. The launch weekend was ok, I got just over 30 downloads. After the launch weekend I was getting a few downloads per day which soon turned to 0 downloads per day shortly before Christmas. After realising that Christmas is a highly competitive time to get noticed, I decided to make it free over the festive period, this netted me 1500 downloads over a week. It was great to know that people were downloading and playing the game, also I got some positive reviews and great feedback too. During January, I experimented with a free period again for 5 days, netting me 1600 downloads and more positive reviews (along with a couple negative . 100 more downloads than the Christmas period in 2 less days. Here are a few stats captured by Flurry Analytics. I Track iPad and iPhone usage separately Surprisingly there is an almost 50/50 split on iPhone and iPad use. 1435 unique users on iPad and 1401 on iPhone. The amount of sessions (times the app has been open/closed) is almost a direct split too, 4937 sessions on iPad, 4979 on iPhone. This breaks down to the average user uses the app 3-4 times. I have found that between 52%-54% of users on iPad & iPhone only use the app once. The median session length (time spent inside the app) is 54 seconds for iPad and 58 seconds for iPhone. A total of 6548 games have been played with 217,606 correct answers given vs 23,456 (I didn't make that up!) wrong answers. Looking at devices used, I was a little surprised to see the older generation iPad 2 with 36% of the usage. It is refreshing to know also that nearly 90% of users across both hardware sets are using iOS 6.x. Looking at the past month, I have received an average of 3 downloads per day, and have totaled $83.40 in 2 months. Given the time I have put into this over a 6 week period, I have estimated my return to be around $1.50 per hour. Luckily, I do this for the pleasure of learning a new skill, rather then the money at this point. It has not deterred me from continuing to learn and develop new applications. The knowledge I have learnt after this is priceless, and I am happy to have this app in my portfolio along with any future revenue that it makes.